In Small Things Remembered » The opening of the Traz Khaja Noor Flume. 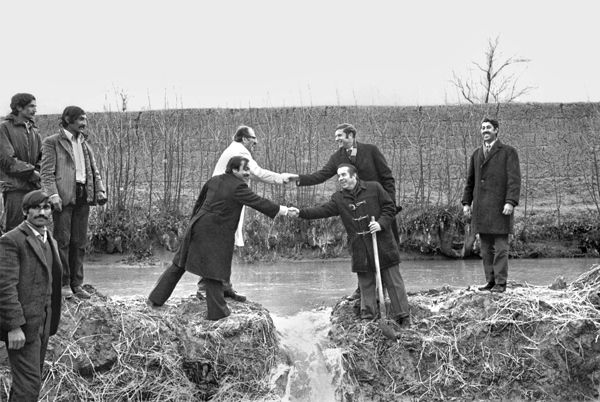 The opening of the Traz Khaja Noor Flume. USAID used lessons learned in the Helmand Valley to improve the lives of Afghans in other provinces through its Rural Works Project. This U.S.-Afghan initiative involved the construction of roads and irrigation canals, resulting in increased arable land, larger crop yields, and greater access to wider markets. To celebrate the completion of a successful project, U.S. Ambassador Theodore Eliot and USAID Director Vincent Brown (right) congratulate Herat Governor Gholam Ali Ayin and Rural Development Department President Mir Mohammed Sediq.